In order to evaluate the cheapest options for accepting credit cards as a small business owner, it is essential to understand the process that takes place any time a credit card action does occur. There are many options out there including online credit card payments, accepting credit card payments through options like PayPal and Square or directly through your website are becoming more commonplace in the business world. In-person credit card transactions are still used by many small business owners who operate a store, venue or business where in-person transactions take place regularly. Some companies are working to make the online and in-person transaction work together like Square. • The cardholder, or customer presents their credit card at the POS, or point-of-sale. Credit card information details like account number, expiration date, billing address and codes are provided for online sales. This can also be done by phone, max or mail to the merchant; now, more commonly it can be done digitally. In this case the purchaser will enter the payment into the payment page or digitally to the merchant’s system. • Merchant then swipes the card and puts their information in authorizing the merchant to make the charge to their credit card. • Processor approves the authorization request and information once the merchant then sends the authorization approval with a receipt authorizing the sale. If the request is declined, the processor is also informed. The cardholder’s account is then debited by the issuer. • The issuer then approves or declines the pending transaction. The merchant then transmits the credit card transactions all together to the processor for settlement. • The processor then goes through and submits the transactions to appropriate card issuers for payment. With the cybersphere becoming ever more of a threat to small business owners, it is important that you choose an experienced provider like TransFirst. A credit card company is also known as an issuer. Credit card companies are financial institutions (usually known as banks). Credit Card networks are the services that decide where credit cards are used to facilitate payments between credit card users, merchants and credit card issuers. Where this becomes complicated is when credit card networks also issue credit cards. The most common examples of this are American Express and Discover. The four largest credit card conglomerates are Visa, MasterCard, American Express, and Discover. They are essentially the intermediary between merchants and credit card companies approving transactions and setting the terms for them known as interchange fee and fraud liability. Interchange fee is the fee charge to the merchant. It is important to understand the importance of accepting credit cards as a small business; retail businesses increase revenue by 40 percent and online businesses are facing the increasing need to use credit card payment. As we delved into the background of using credit cards, the credit card process is a complex interaction that occurs in person, but very much in the stratosphere of the Internet. There are two main options you require as a merchant who accepts credit cards as a merchant. Firstly, you must have a card reader that consists of the physical keypad and credit card swiper. You will commonly see this if you make a transaction in a deli, gas station, apparel store or restaurant and so forth. This is commonly known in the industry as the POS system. POS is the abbreviation for point-of-sale because this is the point at which the sale transaction occurs. Next is the merchant account provider that connects you to the credit card network. Using a nominal fee, this deals with all the behind-the-scenes work needed to process credit cards. It is becoming more common to include both the card reader and merchant account provider into one package because this assists the small business owner by making it easier and cheaper to utilize the technology. Square has become a leader in the POS game, commonly seen on tablets at restaurants and storefronts. They have a user-friendly interface that gives the customer the ability to leave a tip, if necessary, on the card reader and to sign off on the transaction with the touch screen. Digital receipts and inventory management also come with the Square package. Another option is to have a separate merchant account provider that sometimes is inclusive of lower transaction fees than you would face with Square. This is a more complicated process and takes longer to setup with a savings that occurs that would not with Square once you hit near the $20k profit range. New forms of payment providers are coming to market every day and two of the most common ones used by small business owners are Square that is considered a flat rate merchant account provider or Payline, which is an interchange plus merchant account provider. Flat Rate Pricing Providers allows your small business to pay a flat percentage rate each time a retail card swipe in your store takes place. Square is the top provider of this as they offer 2.75% for all swiped transactions no matter what card your customer is using. Tiered pricing is a practical solution for small business providers. Monthly credit card revenue versus average purchase value is the best way to determine which is the best option for you on an economical level as a small business owner. Square’s processing fees are less than Payline if your business income is less because if you are earning $12,500 per month in credit card revenue your yearly cost will be $4,125 while your monthly processing fees will be $343.75. Your yearly annual cost for Payline will be $285.18 with a cost of POS software at $69 per month whereas there is no monthly cost for Square. Processing fees at this rate are $343.75 per month for Square and $285.18 per month for Payline. Whereas, if your revenue is $25,000 and you are a Square user, your total annual cost will be $8,250 and processing fees will be $687.50. Additionally Payline will require a total annual cost of $7,852 with processing fees at a monthly rate of $570.36. The service fees per month at either revenue rate are $15 while the cost of POS software per month is $69. The monthly processing fees for Square at a $10 average purchase value are $687.60 with a $0.275 processing fee per purchase rate and are $937.50 in monthly processing fees for Payline with a $10 average purchase value and charging at $0.371 on Payline. Other methods are Interchange Plus Pricing Providers which incorporate the fees that are charged by your customer’s bank in addition to processing fees charged by Visa, Mastercard and Discover – known as the interchange rate. Some consider interchange-plus to be the best model on the market because they come in this two-part format of percentage fee and per-transaction fee. The upside of this is that merchant service providers are able to price their accounts fairly because merchants who process more business then pay more fees. Smaller merchants also benefit because they do not get in trouble for dealing with less business. If you choose this route, your business will also be a certified Benefit Corporation or B Corp. Interchange-plus pricing allows you to see exactly the amount of money being paid to the card-issuing banks and how much went to a card association, like Dharma. We recommend Payline Data as the top small business provider with rates of 0.2-0.5 percent +15 cents per transaction. Payline offers the credit card machine, POS system, mobile, online and phone/mail credit card processing with a 24-7 phone and live chat. The ability to offer online and mobile services is rare and we believe there are other options for just mobile or online usage of credit card processing. For online solely, re recommend using the Strip service whose rates come in at 2.9 percent and 30 cents per transaction. Online and mobile credit card processing is offered by Stripe in addition to email availability to report issues and contact representatives to call you to discuss any problems. The best mobile option is the Square that comes in at 2.75 percent flat rate per transaction. Mobile solutions, POS and online card processing are offered by Square along with phone support during business hours. When it comes to low-volume options, Paypal is a good option offering rates of 2.2 to 2.9 percent at 30 cents per transaction with mobile, online and POS credit card processing and 24/7 phone and email support. Lastly, high-volume businesses will serve best with flagship merchant services at rates ranging from 0.38 to 1.58 percent and 19-21 cents per transaction. Their solutions are Credit Card machines, POS, mobile, phone/mail and online credit card processing. 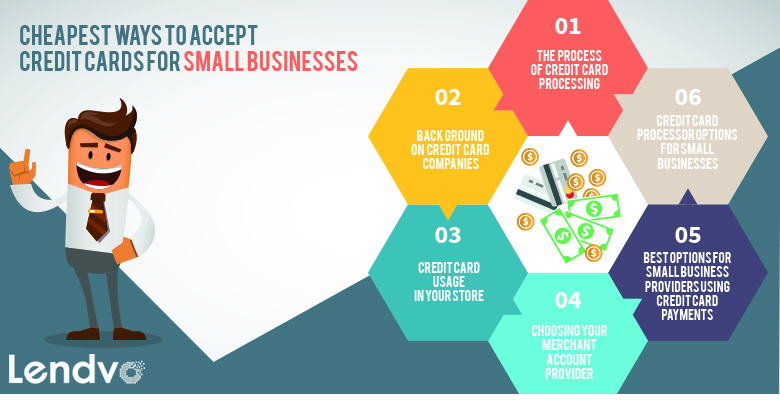 In order to evaluate the options of Credit Card Processers for small businesses in addition to Square and Paypal, which are two of the most popular that we have already mentioned we evaluated a variety of factors. The price that businesses charge and save based on which credit card processor they choose to use include EMV capability, merchant services, types of payments accepted, types of processing offered, contracts and service terms, ease of setup and use, equipment setup, funding and processing time, merchant services offered as well as other features and benefits offered by different credit card processing companies. Amazon Local Register offers no monthly fees, chargeback fees or international fees and is available for use on iOS, Android and Amazon’s Fire OS device. They also offer one of the lowest swipe rates in the industry. Authorize.Net is a commonly used payment gateway provider that has been in the business since 1996 and offers a variety of small businesses their services with affordable month-to-month pricing. They offer a free mobile app, website payments seal and free fraud tools to go with their 24/7 support. They won the ACE, Achievement in Customer Service award from Confirmit in 2008-2016. Braintree prides themselves on being an all-in-one payment partner with both small and large businesses. They accept and split payments to create better business opportunities and revenue for their clients. They offer a seamless checkout experience, 24/7 support and advanced fraud protection. Braintree is a PayPal service which allows you to be backed by one of the most trusted and established financial technology services in the business and their innovative technology. Cayan used to be a merchant warehouse and now offers top of the line merchant account services and has created their own software and equipment to process credit card transactions as they have created their own software and equipment to process credit card transactions. For their online processing needs they created MerchantWARE Payment Gateway. This is a full service payment, report and transaction software platform. They are ideal for any type and size of business with simple credit card processing. CreditCardProcessing.com is a month-to-month service that offers tiered and interchange-plus pricing plans along with competitive pricing on basic EMV-compliant terminals. They offer solutions for retailers, restaurant and e-commerce businesses. Mobile credit card processing, phone and mail orders are also available for their merchant accounts including VISA, MasterCard, American Express, Discover and Star. Dharma Merchant Services offers services for stores, nonprofits and e-commerce businesses. They are a certified green business and rare in the market of credit card processors. Additionally fifty percent of their profit is donated to charity. They process payments virtually and over the phone while accepting credit cards at your retail & POS locations. Their rates for restaurants are low with quick-serve merchants. They offer interchange-plus pricing, no long-term contracts or hidden fees accepting all payment types. Flagship Merchant Services offers boasts offering the lowest overall cost commitment at 0.38% and $0.19 per transaction. Their service also comes with a free Credit Card Reader available for your mobile phone or tables that comes with each account. Their Authorize.net gateway system provides you with the ability to take payments online and a free shopping cart added to you website. Helcim offers month-to-month service, monthly fees including PCI compliance, the lowest interchange-plus rates and transparent pricing. They are one of the only processors that offer rate guarantee in their application and their services are available on a virtual terminal, via mobile (iPhone and Android). They pride themselves on giving businesses the opportunity to accept credit card payments at affordable rates. They thrive themselves on transparency. National Bank Card has an easy application process, live customer support, BBB A+ rating, wholesale rates, next day payments, no cancellation or set up fee to go along with same day setup. They offer a low monthly fee, month-to-month service and the lowest cost for a basic EMV-compliant terminal. Their pricing is extremely competitive for its tiered and interchange-plus pricing options. PaymentDepot has an innovative wholesale pricing system with membership fees including PCI compliance. There are no cancellation fees and they offer a membership-based pricing plan where you pay per transaction fee and with wholesale interchange-plus rates. Square is the one of the most highly regarded credit card processors in the business. Their technology is created for Apple users, but can be compatible with other technology. It allows for seamless transaction between customer and merchant that almost feels as if you are playing a game. There are no credit card processing fees and you can begin with a simple credit card reader then later move onto a square POS system as your business grows. Payline Date offers competitive service terms and customer support with valid processing costs that set apart its fees although they do charge a higher-than-average monthly fee, an upside is you can choose two simple, transparent pricing plans. They are a credit card processor that offers an easy application process with great terms. Their costs and fees are 0.20% + $0.10 and this information is available on the company’s website as one of its pricing options. The pro plan for businesses that process more than $5,000 per month is different than the plan that processes less than $5,000. They have many of the standard fees that credit card processors charge, including a monthly fee, a PCI-compliance fee and a monthly minimum. None are overbearing and the monthly fee of $20 is higher than most other processors in the market. Payment Depot is thought of by some to be the best payment processor for large transactions since it has a large selection of membership plans, pricing options and customer support. They are commonly used by national retailers and beneficial for businesses processing up to $20,000 per month. This is beneficial for small businesses, but a downside for smaller businesses is that they require a $29 monthly fee and 25 cents interchange fee. It is the simplest and fastest service to process credit cards using a smartphone or tablet.